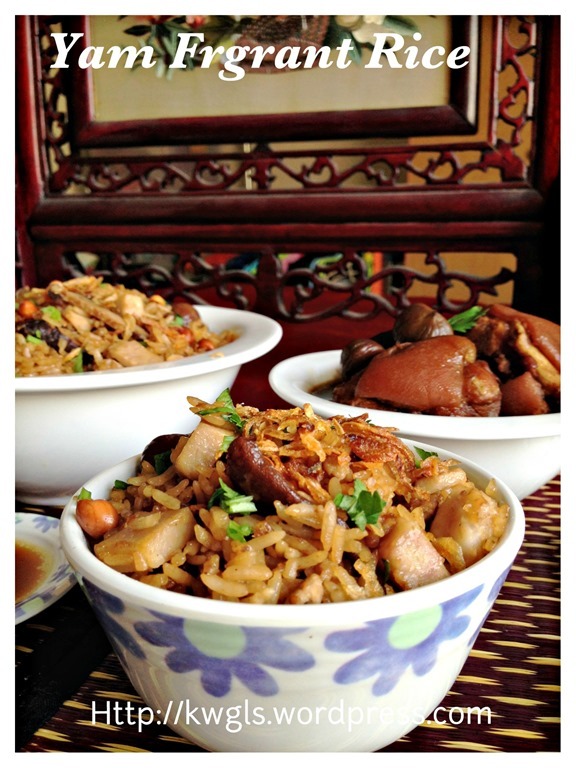 Yam rice is a fragrant rice usually served with Bakuteh (Pork Rib Tea or 肉骨茶）and I can’t recall if my late mum have ever prepared it. 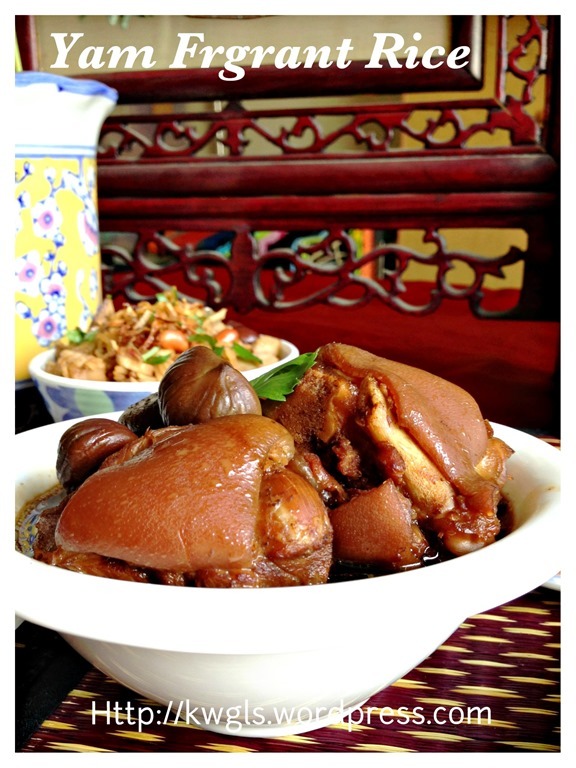 However, it was one of my favourite dish when I am dining in Bakuteh stalls in Kuala Lumpur and Singapore. 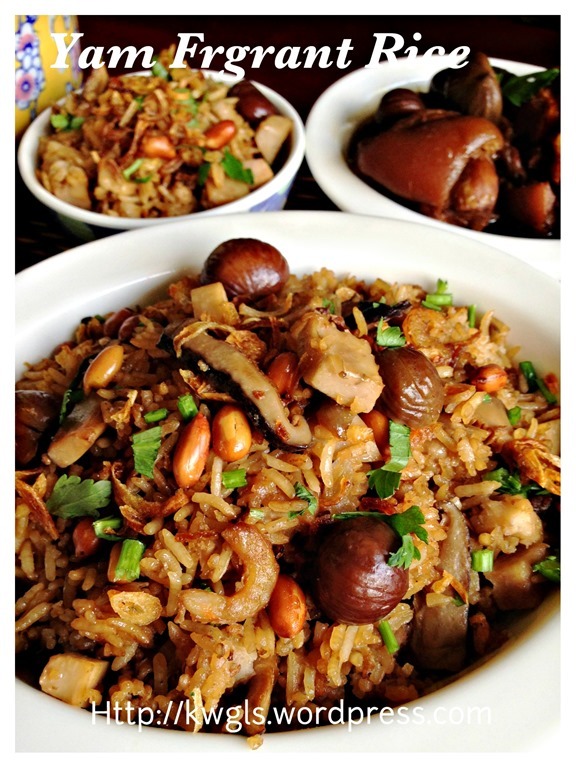 Sorry for not being humble, I knew this is a very simple recipe and most important of all, the essential ingredients of this rice dish are mushrooms, small dry shrimps and yam that create a difference with other rice dishes. I told my personal friends that I blogged what my family are eating and I don’t blog extremely exotic cuisines that nobody will be eating the food after my picture taking session. 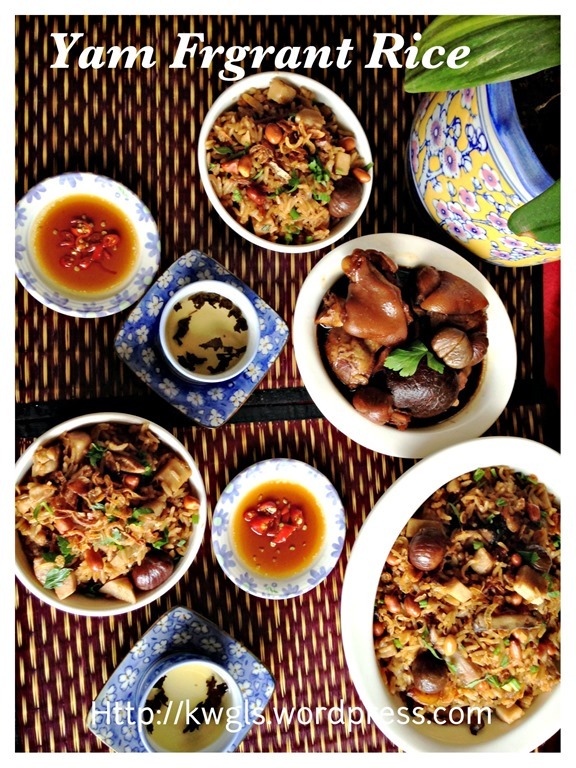 I blogged practical and easy recipes that may benefits busy house chefs in their daily consumption. While I was doing my marketing yesterday, I saw some yam in the wet market. Prices are reasonable and appeared to be rather fresh. I have decided to buy one and cooked this rice dish. Usually, when I buy the yam, I will press the yam. If the yam is firm, it is generally quite good. I will ask the vegetable seller to cut the bottom part of the yam for me and most will do as it is a rather standard practise. If I found that the yam is whitish and starchy, I will buy the yam. But yam, though a root plant, cannot keep for long. It is best to prepare it one or two days after your purchase. It had to be kept in a cool airy area. In a hot wok, put the oil and add in the chopped garlic and white part of spring onion. Sauté under medium to high heat until fragrant but before turning golden. Add in the mushroom slices, baby shrimps and white pepper. Stir fry until the shallot are golden. 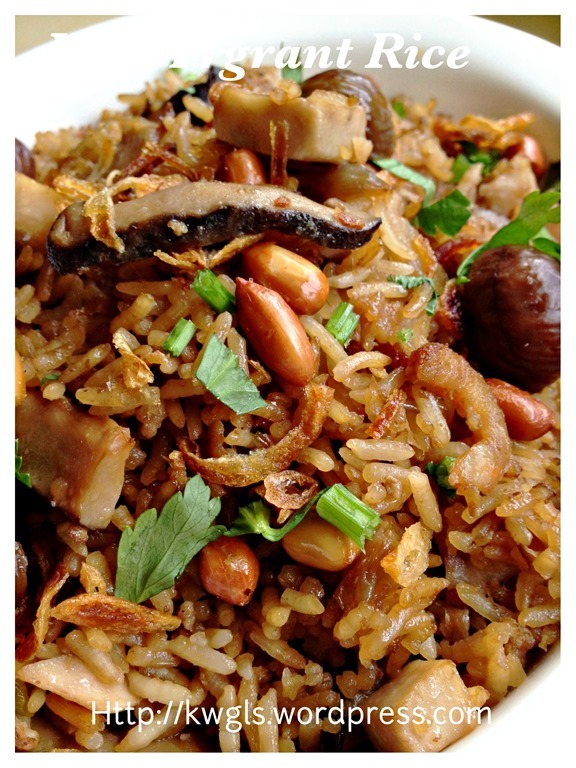 You should smell a mixture of aroma from the dry shrimps, mushrooms and shallots. 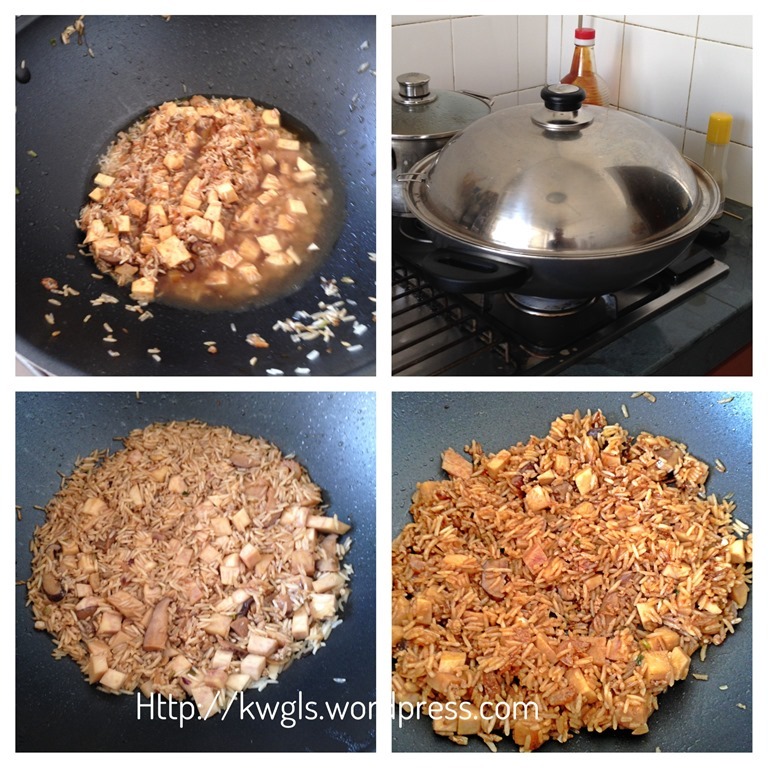 Add in the minced meat, stir fry until well mixed (about 1 –2 minutes). Add in the taro and and uncooked rice. Stir fry until well mix. 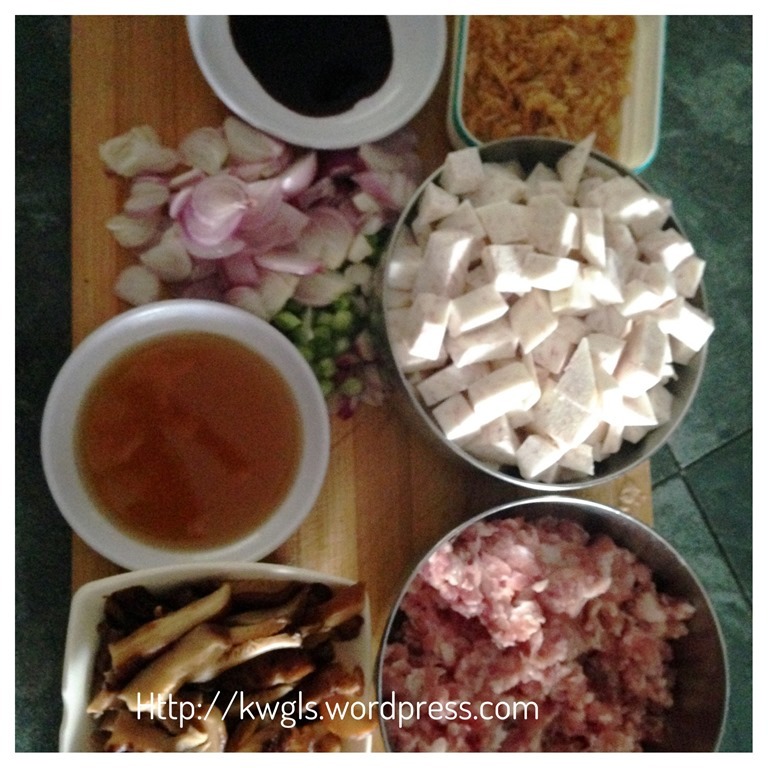 Add in all the condiments (oyster sauce, light soya sauce, sugar or seasonings of choice, dark soya sauce). Stir until well mix. In this stage, you can adjust the colour of the rice to see if it is too light to your preference. If yes, do add in a bit more dark soya sauce. This recipe’s provide you the minimum seasonings. 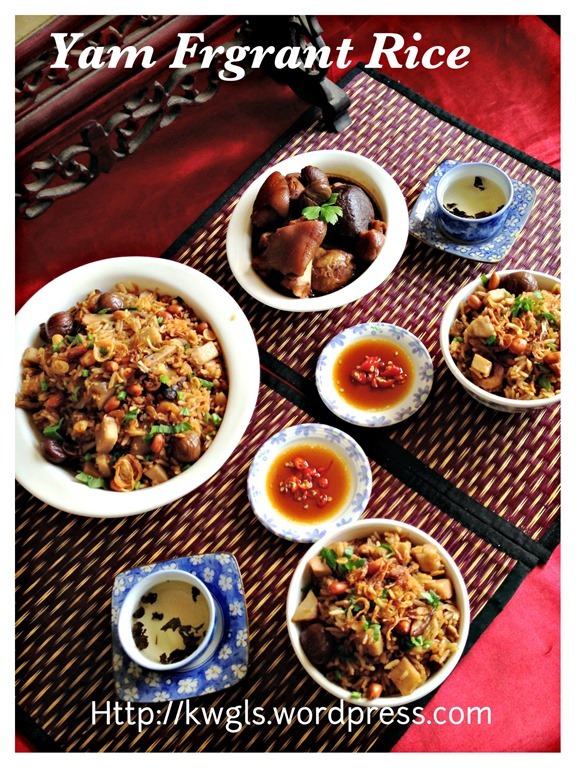 You can also take this opportunity to take a grain of rice and taste whether it suits your family’s taste buds. Once done, transfer the rice to the rice cooker. 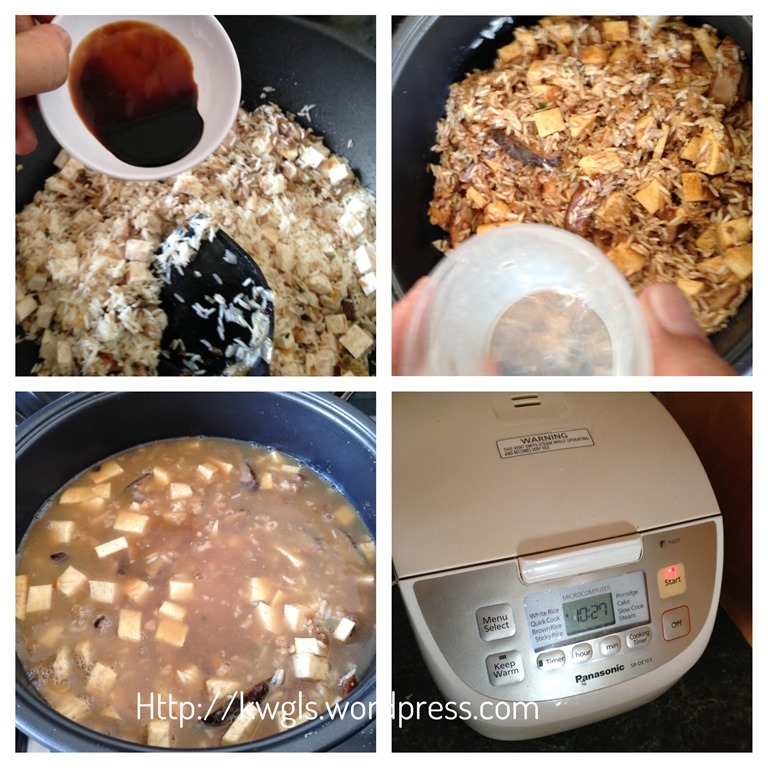 Add in about 2.5 cups of water stir well and cook according to your rice cooker instruction. Note that the water of the rice have to be slightly less as it had already absorb part of the liquid from what you have stir fried earlier. Otherwise, your rice can be rather soggy. If you want, you can continue to use the wok to cook your rice. Add in the water and cook under medium heat, occasionally stir fry the rice. 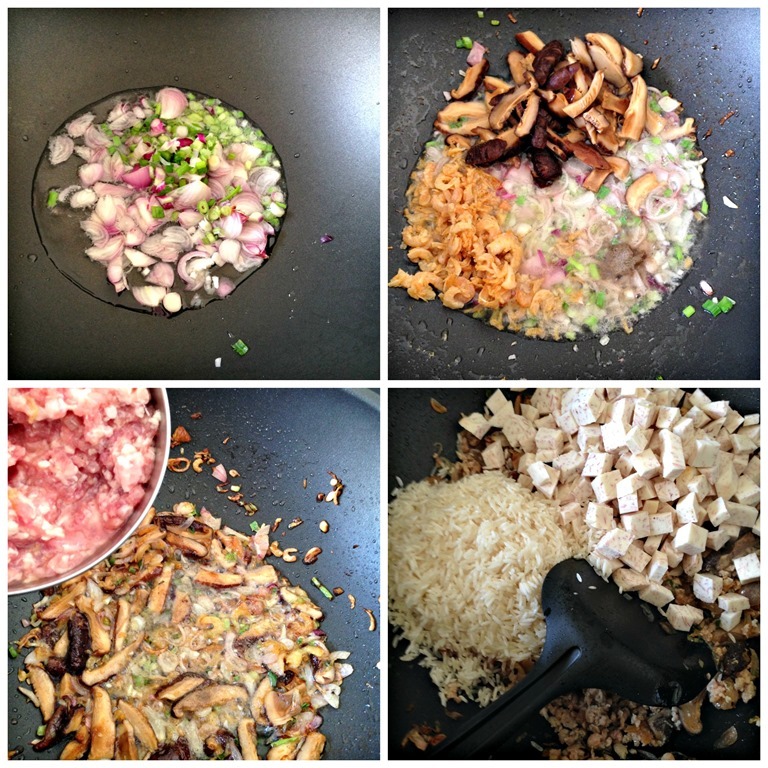 Cook the rice until it dries up and becomes soft. For this method, it is best that you use a non-stick wok. 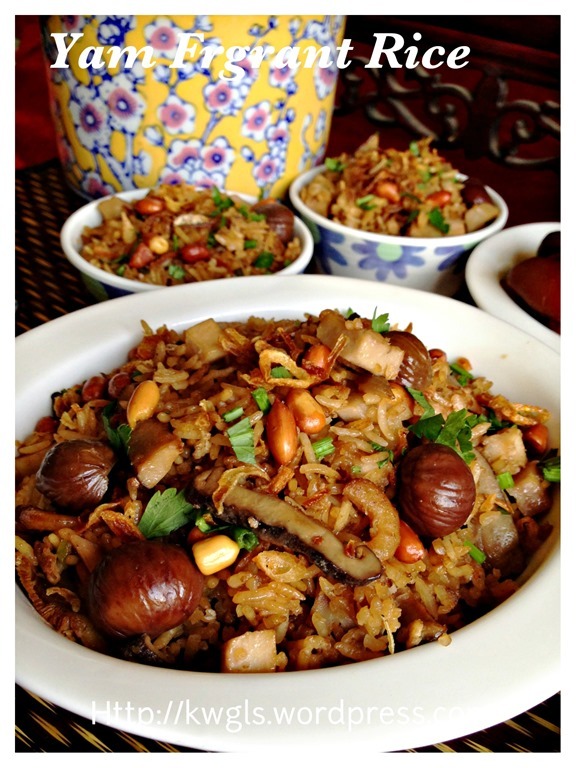 For serving, have your rice in a serving plate or bowl, top with garnishes such as chopped spring onion, peanuts, chestnuts and additional shallot. 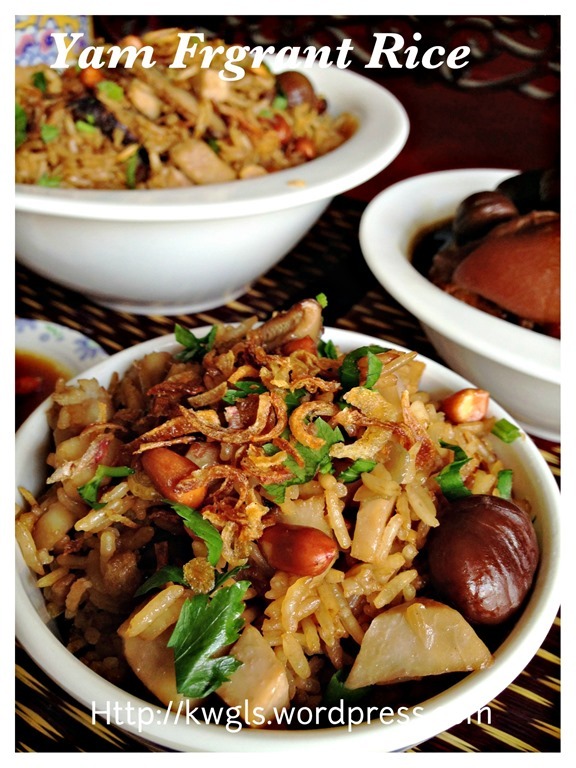 Can be a standalone rice dish or part of the dish in a typical Chinese set meal. This is a simple recipe. Whether or not your rice is fragrant will very much depend on the first part of stir frying your shallots and dry shrimps. That is the critical part of the recipe. Remember to use slightly less water to cook your rice if you prefer beautiful grainy rice. Flexibility of the dish is there, you can always add Chinese sausages instead of minced meat and if you are game enough, use lard instead of normal cooking oil will provide you a totally different fragrance..
You can also join the FOOD BLOGGERS AND FOODIES UNITED FACEBOOK GROUP to see more recipes. 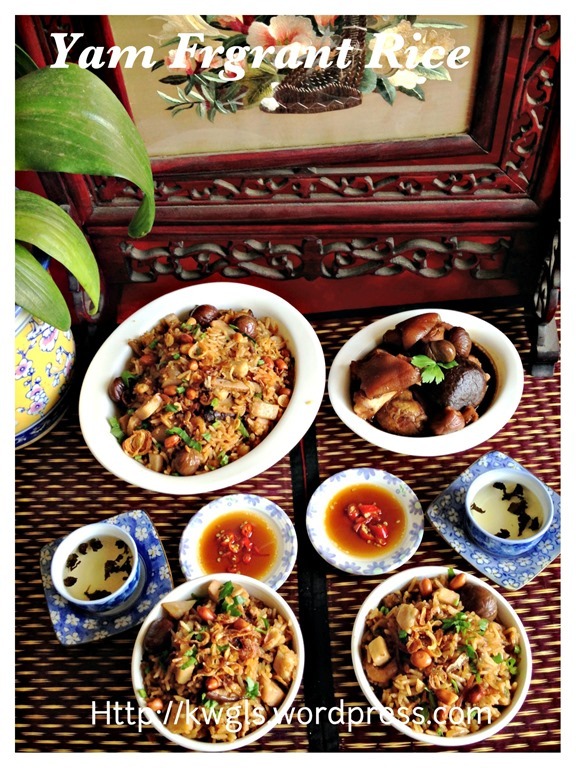 Currently there are about 9,200 members sharing various food photos . 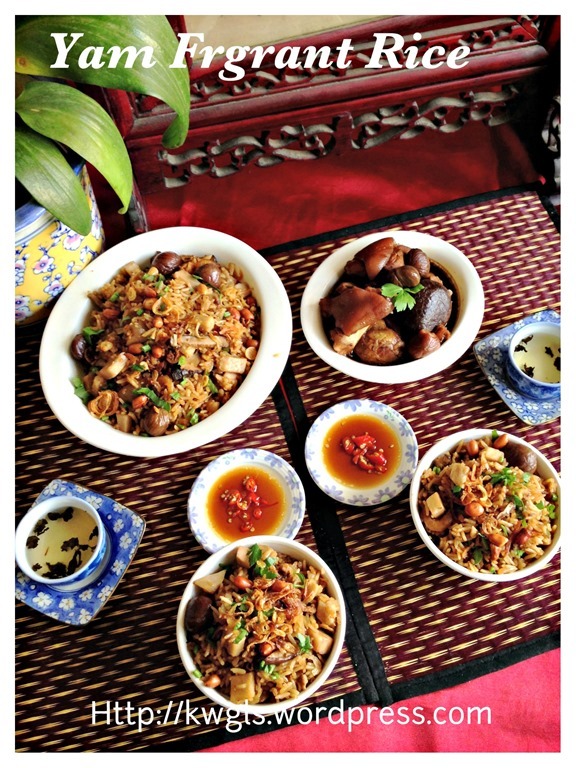 I am posting my daily home cooked food in the above Facebook Group daily. I would be more than happy if you can post in the Group for the recipes that you tried from my blog. 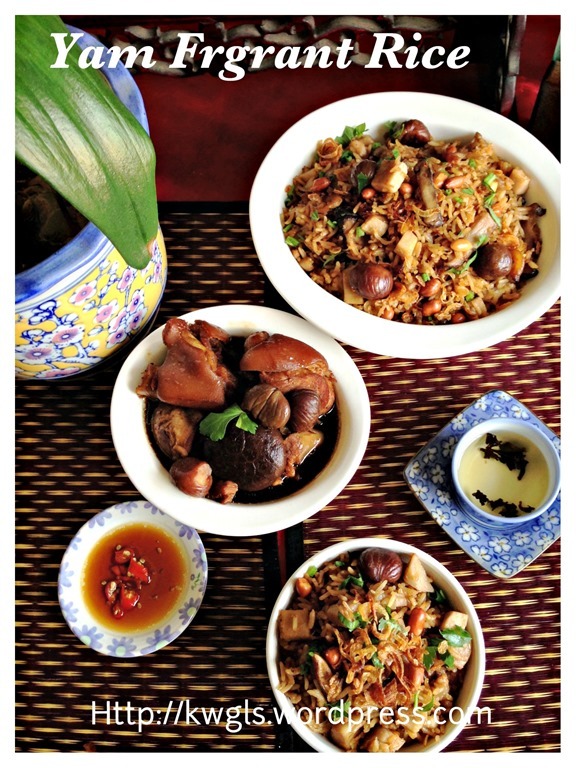 This entry was posted in Food Preparation Series, Noodles, Rice and Others and tagged 芋头饭， kenneth goh, 芋头香饭, GUAI SHU SHU, Guaishushu, postaday, taro rice, yam rice. Bookmark the permalink.